We decided to get goats at exactly the same time as I was managing a large goat culling contract. Ironic? Maybe not. Goats are well known for their voracious eating as well as for their intelligence (or at the very least, their escapism). It is not their fault that they breed rapidly and successfully, and are tremendous eating machines. It is the fault of people for letting them escape. But you can’t go around shooting people. So, knowing full well what we were getting ourselves into (or at least thinking we did), we went and got ourselves a goat. The goat’s job was to be clearing what had once upon a time been a paddock next to the house. We knew there had been a paddock from the decrepit fencing and the relics of a shed, as well as a historic painting which showed a couple of horses there. The ‘paddock’ was now full of broom and blackberry, perfect fodder for goats. Our first job was to fix up the old shed for a new goat house. Some new corrugated iron and many pellets and nails later and we were good to go. We selected our goat with care. 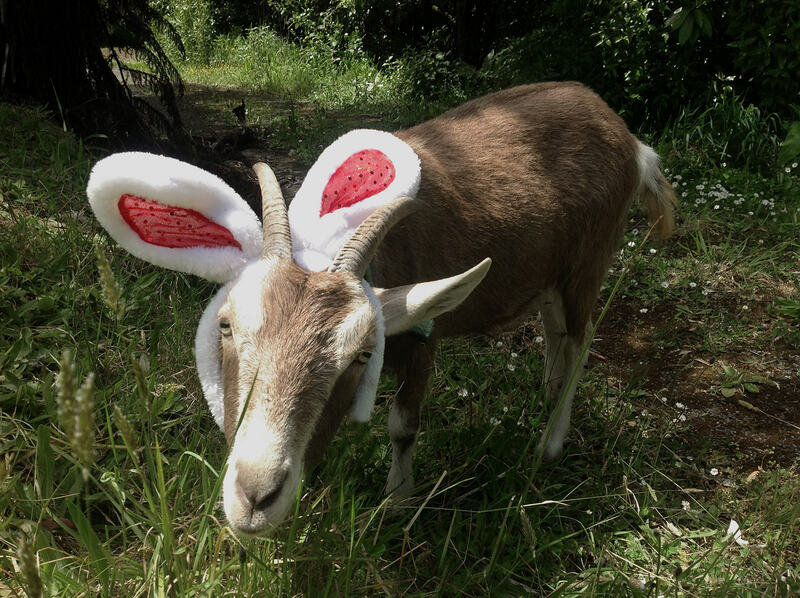 Well, actually we just went for the cutest goat we could find; an Arapawa kid. 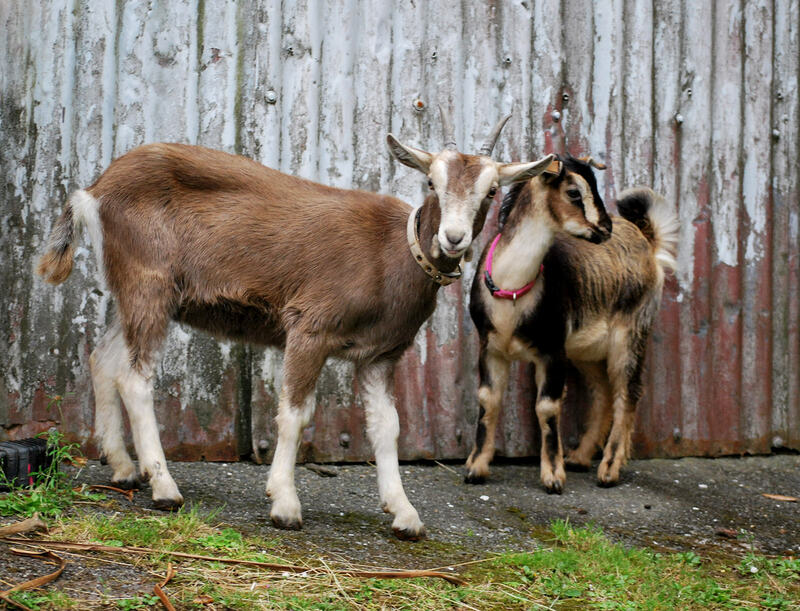 I love the conservation story of the Arapawa goats. 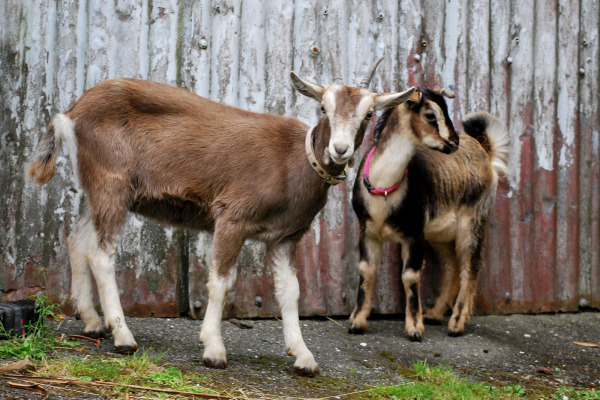 It goes something like this; Captain Cook released a small breed of goat onto Arapawa Island in the Marlborough Sounds. Presumably as strategic stockpiling of food sources…or knowing goats, perhaps the darned things just escaped off the ship. Then goats did what they do best, bred and ate. To the detriment of the island and the native flora and fauna on it. Eventually many years later, the Department of Conservation decided to begin a culling programme to eradicate goats off the island and begin its restoration. 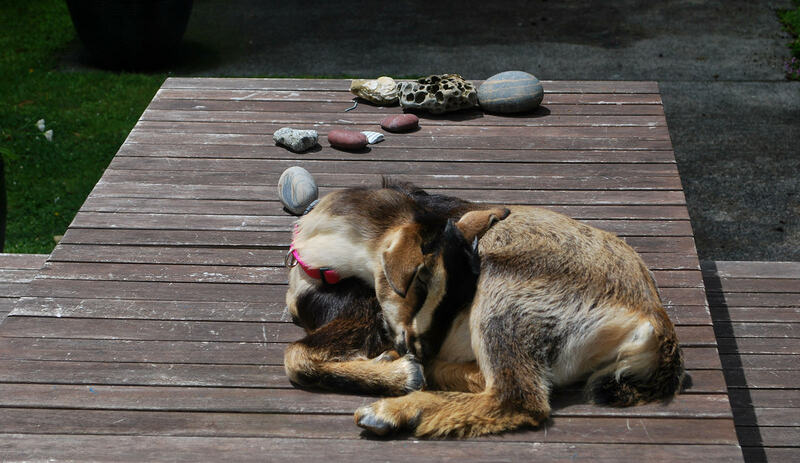 The trouble was that by then, the goats were extinct everywhere else in the world, and these ‘Arapawa’ goats were now the last of their kind and officially a rare breed, found only in New Zealand. I understand both sides of this conservation story, and so was happy to take part in both the preservation of a rare breed and hopefully freeing up the island for eventual restoration also. 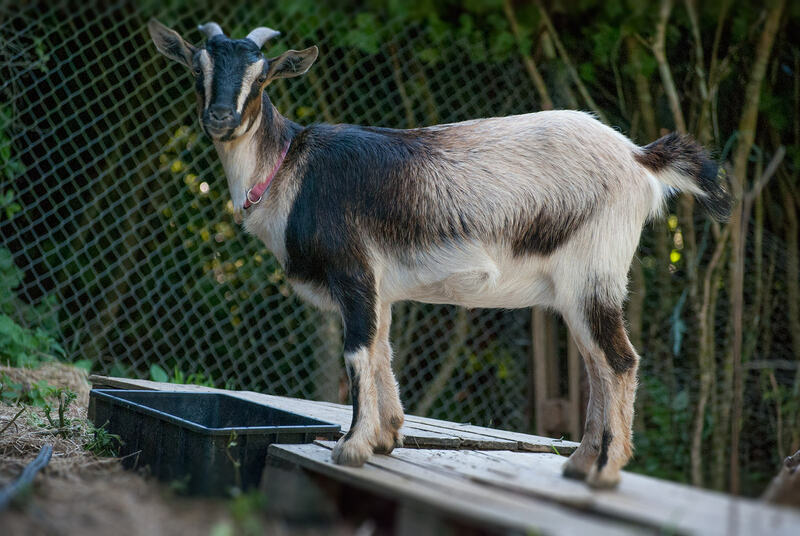 Two things we were going to quickly learn about goats…1. fences need to be robust, really robust and 2. they need company. Our first notable error was that we had thought the fencing was mostly okay, it was the square ‘pig fencing’ which I reckoned would keep in a goat. 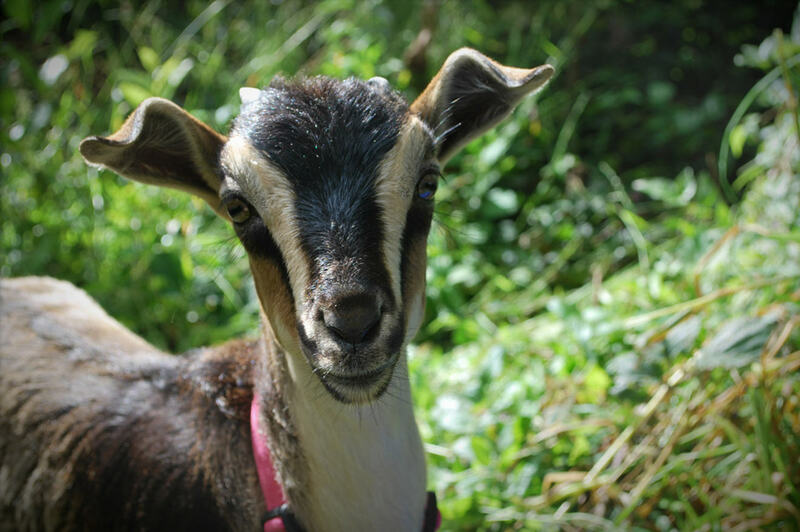 We put our new kid goat Meadow into her new home and she simply stepped through the fence. Hmmm, we would need to do some work. Our second error was just getting one goat. For the next week, Tony had a little shadow. Meadow, would not leave him alone. She sat next to him while he was working on the computer, and she would even follow him into the toilet. 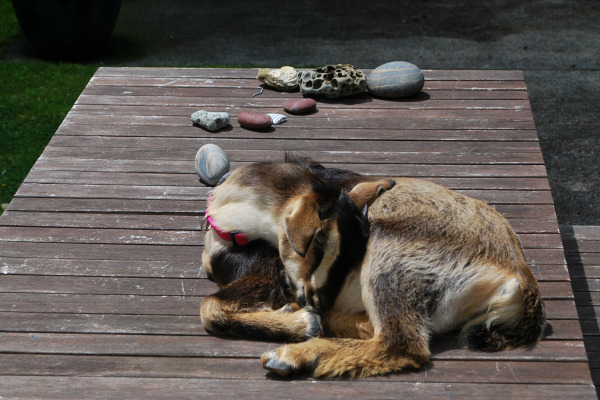 Some problems of a house goat were immediately apparent…obviously the toileting. I had heard rumour of some people having success with house training goats, but this one seemed to have no awareness about her pooing. The other problem was eating paper, and Jesse got very upset when she ate some of his artwork. Tying her up also didn’t work as she launched into remarkably loud bleating for a goat so small, and we worried about our neighbours and our sanity. Constant goat company just about destroyed Tony. So our urgent priorities were to re-fence the paddock and to find another goat. A patch up job on the fence sorted the first one (for the time being anyway) and a quick call to an acquaintance with some goats sorted the second. Now we had an Arapawa and a Toggenburg/Saneen cross called Cookie. The fence is an ongoing project, continuing to this day. We must have spent hours, and some fairly creative patching keeping the paddock secure. 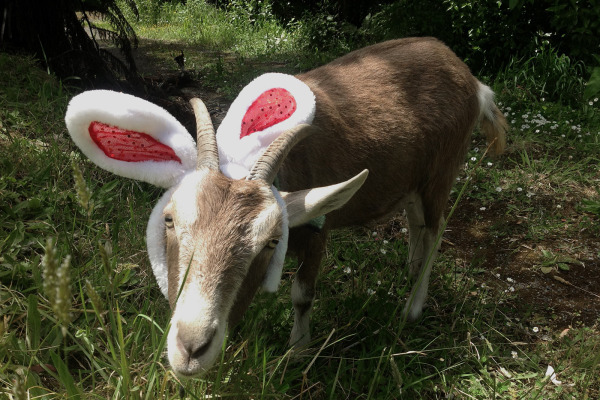 On the success of goats as organic weed control, we have to report them as outstanding. 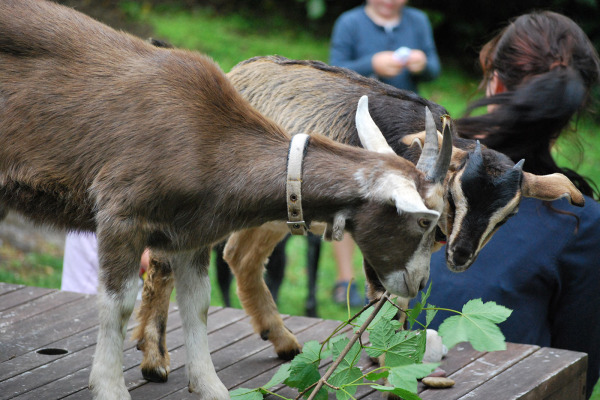 We thought the goats would be busy chomping their way through blackberry for a good 6 months. Try one month! We were able to resow with grass seed, and the historic paddock is now reinstated. There is light down that side of the house, and an often very amusing view of a couple of silly goats playing together.